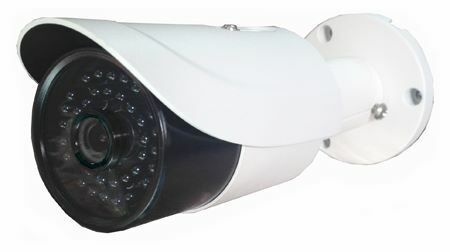 The CM42IR-TVI outdoor bullet camera is equipped with the Sony 222 1/3" sensor, 4.2mm lens and 36 infrared LEDs Producing 1600 lines of resolution this HD-TVI camera can monitor a large area both day and night. The camera's day/night function provides clear full color images during the day then switches to black and white images at night. The infrared night vision range is 100 feet or more depending on the reflectiveness of the scene. The 4.2mm lens and 16:9 aspect ratio provide a good overall view and the 1080p resolution provides higher image quality and detail than standard analog cameras. If you need a compact sized high definition camera with 100 feet of night vision for indoor or outdoor use the CM42IR-TVI camera is a good choice. 3-axis cable management bracket for easy mounting.